Hey everyone! 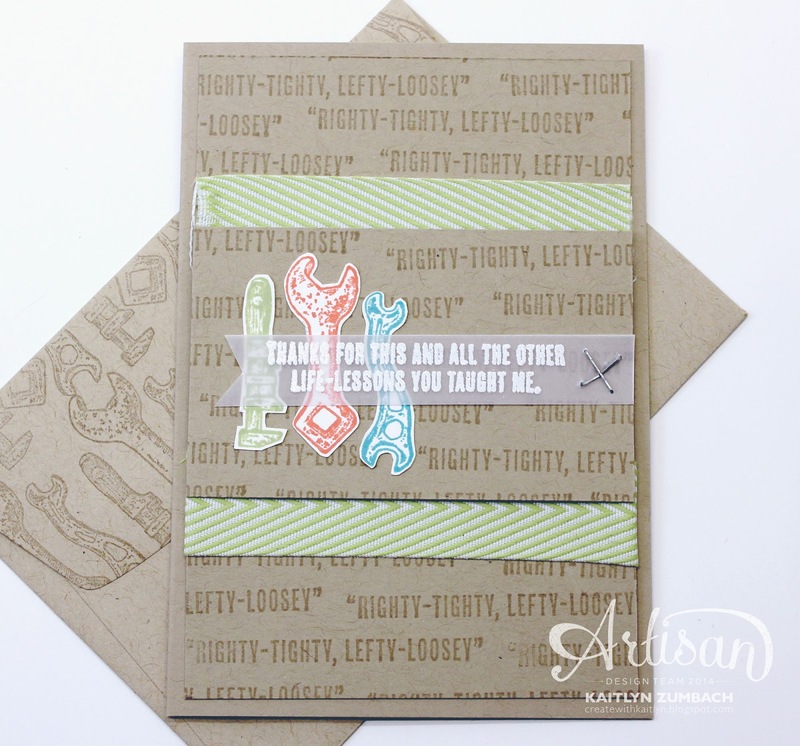 Welcome to the last Artisan Design Team Blog Hop of April! This week we are all featuring the great Guy Greetings Stamp Set. This is a really great stamp set for any man in your life. Like most people, masculine cards are not my favorite, but I had a lot of fun making a set of Crumb Cake Note Cards & Envelopes with this set. First I want to show you the packaging I made for these cards. 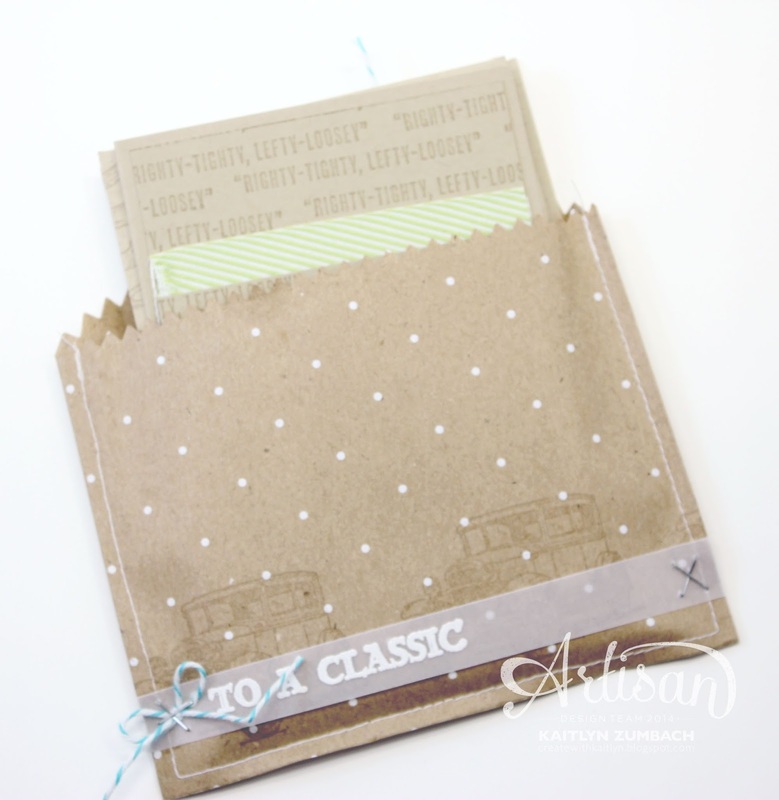 I cut a Polka Dot Bag in half and sewed it shut (you could totally just glue it shut)to make the perfect pocket for the cards and envelopes. I decorated this pocket with some of the same elements that you will find on the cards. So this first card is may favorite! You can change the guy's hats! I put a magnet sheet behind the layer of Crumb Cake Card Stock and then put a little piece of magnet on the back of each of the hats. All of the hats can be switched around to whatever makes you heart happy! This was such an easy thing to do, but it really makes this card unique and special. This card doesn't have any awesome magnetic action happening, but it is still a lot of fun! The pattern with the sentiment really creates a lot of energy on this card. Another thing that makes this card fun is the color combination of Bermuda Bay, Pear Pizzazz, and Calypso Coral. Yes. Calypso Coral. That is the last color you would probably reach for to make a masculine card, but it totally works. 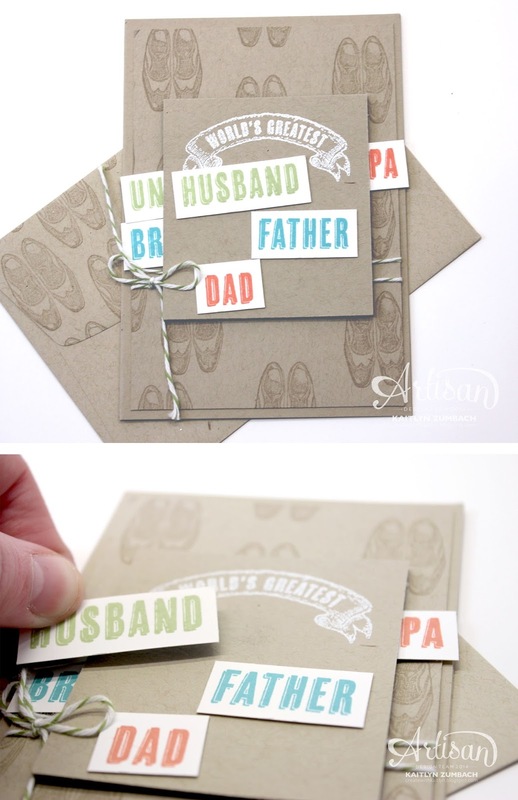 Masculine cards don't always have to be neutral, they can also be trendy and fun! The last card also features some magnetic magic. The idea behind this card is that you can complete the "World's Greatest" with any of the nouns - just swap them out! There is a magnet behind both Crumb Cake layers so the words say put behind the top layer too. You will also notice that each envelope was decorated to match the cards with stamping on the flaps. Touches like these make for memorable cards that everyone will love! 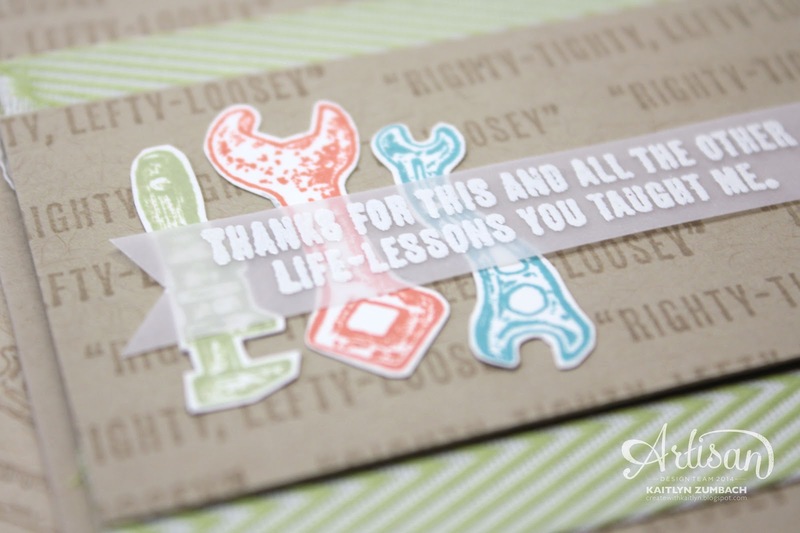 See some more awesome projects with the Guy Greetings Stamp Set by using the button below the continue along the hop!